Shut Down Managers: B.E. with 20 years experience in oil and gas maintenance work. Executed minimum 3 shutdowns. last 5 years in a Manager position. Overall responsibility of shutdown arranging manpower tools machinery planning. Primavera / CMMS Software.Aware of Contractual obligations Controlling Staff and labor around 3000. 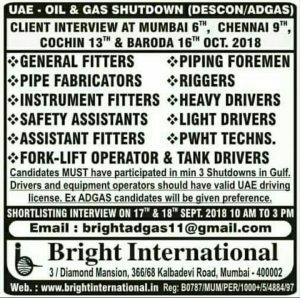 Shift Managers (shutdown Manager): Dip./ B.E.Mechanical minimum 15 years experience (10 years as Supervisory & 5 Years as Superintendent) in maintenance work in Petrochemical industry/ Refining industry. heading group of 50 Engrs. / Supervisors and contractors Manpower. Maintenance of Process Equipment. welding techniques. welding tools and Equipment, testing and quality control measure International Codes & MS Office. Conversant with the Contract and the Contracting System. Mechanical Superintendents: B.E / DME with more than 15 years experience in maintenance work in Petrochemical or Petroleum Refining industry. OTHERS SAME As ABOVE. Mechanical Area/Unit Coordinators: B.E. / DME with minimum 10 years experience in refinery / Petrochemical maintenance. Leading 10 engrr. /supervisors.Responsible for managing a distinct area. OTHERS SAME AS ABOVE. 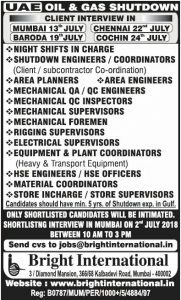 Mechanical Supervisors: DME with more than 1oyears experience in mechanical maintenance works in petrochemical or Power Generation industry of which at least 5 years have been performed in the role of a Mechanical Supervisor. Static, Rotary Maintenance and piping work. Execution QA/ QC / HSE compliance audits on-site procedures and HSE Plans. HSSE Coordinators: BSc. 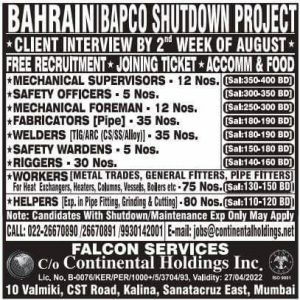 / Graduate With NEBOSH with10 years experience (minimum 5 years experience in Gulf) Shutdown work. Minimum 2 years HSSE coordinator. MS office Max Age 45. HSSE Inspector/Officers: 50 Nos. 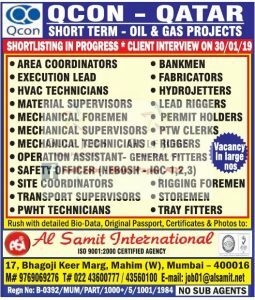 : Graduate with NEBOSH / OSHA 5 to 7 years experience (2 years Gulf Experience) in Oil & Gas industry with maintenance shutdown experience. 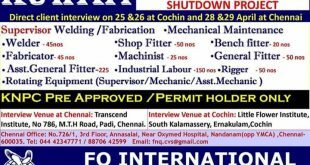 Sir any cnc milling operator job. Rich experience in Permit to work system at Major Hydrocarbon industries. 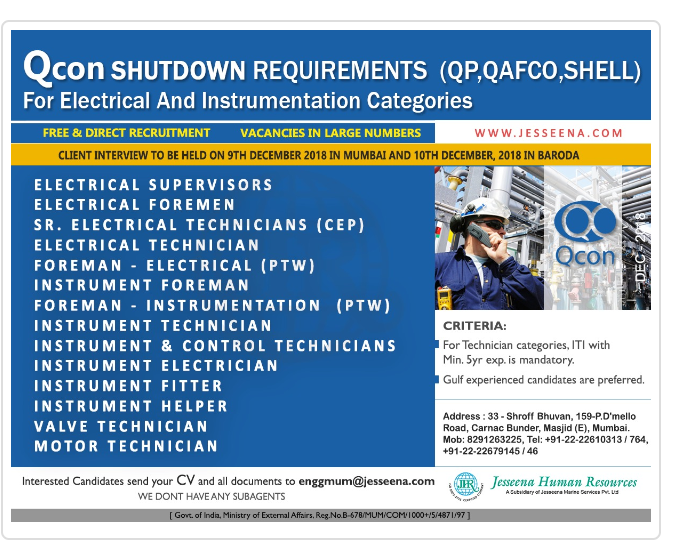 any vacancy for PERMIT TO WORK COORDINATOR. Sir having rich experience permit to work system. Any vacancy for PTW coordinator ? I am ikbal having 10yrs exp as piping foreman in oil &gas industries.i am looking for shutdown job in middle East. looking for shutdown jobs in gulf having 36 yrs experience working in refinery and handled more that 25 shutdowns. Sir. iam driver hevi and light qatar laisens aveyalabel..sir my expeeriens 10 year KSA traylar driver.15 year qatar GAS TANGKAR AND MY laisesns is valued 20/10/2021.. Myself pawan kumar I have 5&1/2 Year experience in the field of Instrument Supervisor With Diploma degree. I need Same. 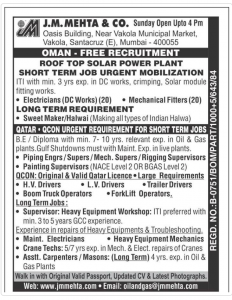 I want to storekeeper job in qatar, dubai, oman,Bahrain . 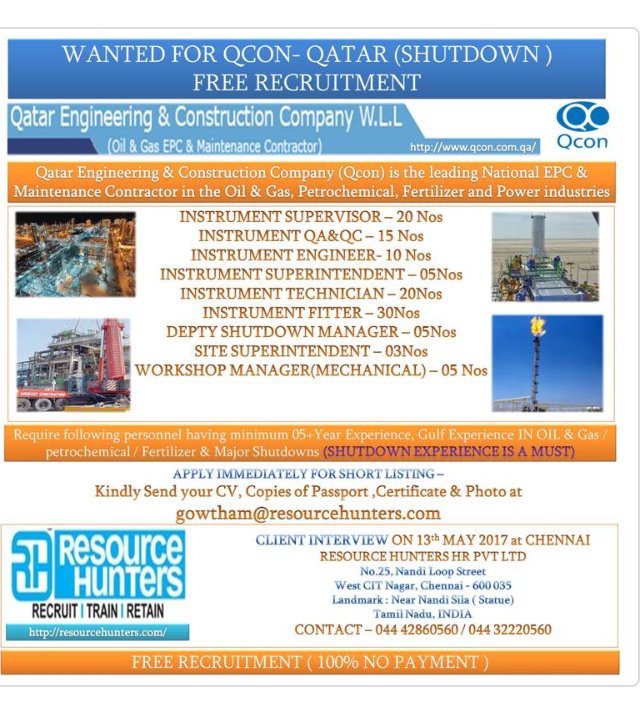 Sir any estim Turbine and gas Turbine job in QATAR. I experience 12 years. I have 7yeard of experience in gulf countries& 7 years in India . I can handle the projects individual from foundation to finish level & also handle the management team. I have 3 yr diploma in instrumentation n i hv 3 yr exp of india, 5 month’s in saidi & Now am working in RasGas from feb 2 to till date as a instrumentation technician. Kindly i will request u that, If u hv any job for my post than must u ill inform me. fire &Indudustrial safety.I have also NEBOSH HSW;First Aid course.I seek a fire watcher job & Assistant Safety job.Ihave well Experience 5 years in oil gas& refinery field. please help. Pls think about that drivers, who dont have other country’s licence but want to do job at other countrys. If anybody gonig first time to out off, then how can he got other country licence.